Here is a tiny distinction that is well worth noticing, as you are learning how to model what works and what doesn’t. In this tiny segment we will explore how you use sounds and image inside your mind. People tend to be driven by one or the other, and which one drives you will determine the speed of your success – and maybe determine if you are at all able to be satisfied. Noticing how and if you and the people around you are driven by “vision” or “sound” will open the door to many other levels of possibility, success and happiness. Back in 2007 we had our first Subjective Modeling Crash Course, where we explored the Inner World, the Patterns and the Strategies of Napoleon Hill. It was a breath taking course, limited to four adventurers. Because Napoleon Hill has a different thinking process and way of perceiving the world than most people do. How he used his “thinking” is way different than most of your friends, parents and family members. The people who primarily influence HOW you think. Hill’s way of thinking changed the lives of millions! Even yours! 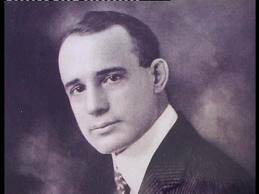 Study history, study the mind of Napoleon Hill – notice not only the words he uses, but the way his vision shows up in the words. Notice too – his voice – his breathing – both relatively high pitched – those indicate a man who is coming from the VISUAL portion of the mind. Howard Hughes was another person you may want to model. Yes he was a little goofy. And YES he too changed the lives of MILLIONS for the better. I just watched the first 30 minutes of “The Avaitor” and enjoyed watching the power of Hughes’s vision. Now here is a key some idiot is going to think is obvious, before he understand the IMPACT IT CAN HAVE on your Life, Health, and Prosperity. You can see it when Hughes was filming his war movie, and you can really see it when he picked up the cigarette girl. (I don’t want to give away too many details.) Get the movie and absorb what you can. This is a very easy to notice HUGE key. This weekend, go out and notice folks who are driven by vision. They tend to WATCH a lot, and then they tend to MOVE a lot. They transform the world, put men on the moon, they make history. They don’t talk much or rely on talking much – on the inside and on the outside. We do need commentators, but do we need so many? Commentators tell you about the big game, visionaries PLAY in the big game. Visionaries play in the BIG GAME? Ready to play more? Now… if you want more, and want to explore how to get this to mesh with YOUR PARTICULAR STRATEGIES AND PATTERNS, then consider doing some phone coaching or private training or get some Almost Free NLP or Crash Courses. Here is a quick test to see if you are stuck in commentary or driven by vision. Do you comment on how this might not work for you… how I could reveal more… how you would miss the pizza and beer…. Envision or comment…. it’s up to you. I can help you get rid of your bs and envision more. You’ve got to play with a visionary to become one. Comments of course are welcomed. Get some time tested crash courses of ours or some Almost Free NLP by clicking the link.